At Adobe’s annual MAX conference today, the company announced a major overhaul of the ten-year-old Creative Suite, which will now be known as Creative Cloud. From now on, you won’t buy CS6 or CS7—you’ll buy a $50 per month subscription to CC (happily, the first year will only cost $30 for anyone with a CS3 or later serial number). What’s the reasoning behind the overhaul? For one thing, an online subscription service could help Adobe curb piracy. For another, it’ll make it easier for customers to opt-in to new product releases throughout the year, rather than dropping a single giant update annually. But more generally, the shift shows Adobe focusing on the way the cloud is integrated with its products. Rather than logging into Creative Cloud to download updates, a newly redesigned app will push CC notifications directly to your desktop—making it easier to update your programs and download new apps. Alongside the new CC system, Adobe unveiled an excellent haul of tool updates. For Photoshop, there’s the Camera Shake Reduction tool, which is every bit as magical as we’d hoped. The new tool lets you "de-blur" your photos with the touch of a simple wand—it's absolutely remarkable in action. There’s also a new Camera Raw filter that lets you apply raw edits as a layer, and an improved 3D painting tool that’s up to 100x faster. Also important: Adobe’s overhauled their image Upsampling algorithm, so you can scale up a small image with far less degradation. Finally, a brand-new Smart Sharpen tool will let us fine-tune how we sharpen images and reduce noise. The new Smart Sharpen tool. All of the other CS programs have received similar tool updates (except for Fireworks, which seems not long for this world). For Muse, there's an awesome Parallax Scrolling tool. For Illustrator, there a number of much-needed additions, like a tool that lets you alter individual characters in a line of text, and a UI prompt that lets you "star" certain typefaces (no more scrolling!). InDesign has also received a major upgrade, bringing it up to speed with the other CS6 programs (finally). Another exciting detail: an iPad stylus that connects directly to the Cloud, preserving the brush settings you use in perpetuity. The new CC app will change how we use Adobe's other apps, like TypeKit and Kuler, which will now sync directly to your desktop. A subscription to CC will let you run your programs on two machines at once—which means you'll be able to sync fonts, styles, and color swatches across machines via the cloud. All of TypeKit's fonts will come as part of a Creative Cloud membership, and you'll be able to download them directly from the CC app. Creative Cloud won't just change how you buy and update Adobe programs—it'll also change how you share your work. Last December, Adobe announced the purchase of Behance, the popular online portfolio site. We hadn’t heard much about why or how they’re going to use the site, until now. Behance Pro will come standard on every CC subscription, which means you’ll be able to save directly from Photoshop to your portfolio on Behance. Screenshots of the new desktop Behance integration. It also means you'll receive friend requests, comments, and pageview updates about your portfolio on your desktop (and yes—you'll be able to opt-out). How you feel about Adobe’s new social outfit likely depends on how you use the programs. For someone working at a huge company, Behance might be utterly useless. For freelancers and students looking to build contacts and find jobs, it could be transformative. 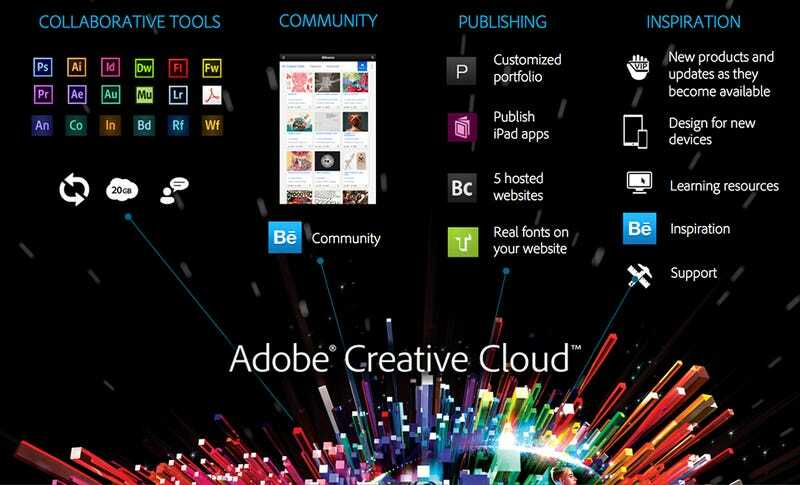 Creative Cloud signals an end to Creative Suite as we know it. There'll never be a CS7, or a CS15, for that matter. And that's OK: doing away with stand-alone software packages will definitely stir a lot of controversy, but it's hard to argue with the logic behind the decision. CC is a strategic move towards consumerization: the hope is that as Adobe's menagerie of programs becomes more ubiquitous, the Creative Cloud and these new social features will entice the average prosumer to subscribe rather than pirate. Will it work? Only time will tell.